FTDI’s CleO35 is simple to program, 3.5 inch 320x480 TFT display with resistive touch panel that allows the construction of human machine interfaces (HMIs) with much higher performance than conventional Arduino display shields are able to deliver. 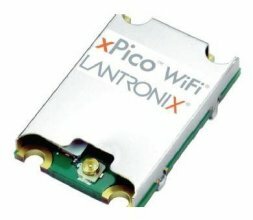 High mechanical stability is one of benefits of a new „SMT“ version of the popular Lantronix xPico WiFi module. Are you familiar with Internet of (every) Things?